Sold by Games and more!!! and Fulfilled by Amazon. Gift-wrap available. Designed for Ellusionist, the Fathom card set is specifically designed with card players and magicians in mind. Features a beautifully designed oceanic theme inspired by Jules Verne's 20,000 Leagues Under The Sea. Inspired by the 4 elements, Fathom is the 1st release in the Origin Series by Ellusionist -- collect all four! 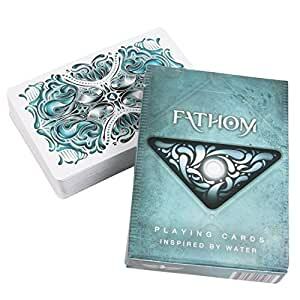 The Fathom deck features high quality, thin USPCC stock and a soft-glide performance finish for flawless sleight of hand techniques. Stacked in mnemonica out of the box. For ages 12 and up. Designed for Ellusionist, the Fathom card set is specifically designed with card players and magicians in mind. Features a beautifully designed oceanic theme inspired by Jules Verne's 20000 Leagues Under The Sea: "A strange twilight world opened up before me, and I felt as the first man to set foot on another planet, an intruder in this mystic garden of the deep." - Jules Verne, 20000 Leagues Under The Sea. The voyage of discovery consists not in seeking new landscapes, but in having new eyes. When we took our world apart and examined its make up, we were left with four simple elements. Earth. Air. Fire... and Water. This is the first of those discoveries, born from the graceful flow of water. The Fathom deck features high quality, thin USPCC stock and a soft-glide performance finish for flawless sleight of hand techniques. These cards are quite striking and a good balance when you want cards that are playable, but have a little something out of the ordinary. There is a very slight pale green tinge to the coloring of these cards, so there is slightly less contrast between the red cards and the black cards then normal, but this helps add to the underwater bubbly feel of the design. The aces are fairly standard looking, but cards 2-10 each have one suit emblem broken up into bubbles, which looks super cool, but still is readable as the suit. The face cards all have a bubble effect which makes them the least readable, but because they are face cards, you never really mistake the suits much. Overall, I mark the Fathom Deck a 4 out of 5 only because I am not crazy about the font they chose for the denomination in the corners of the cards. It's a little much and makes the cards a little harder to read than necessary (but they are still quite playable). Still, an easier to read font would have made these cards 5/5. Looking forward to trying these out at some card parties this weekend. I'm rating this based off aesthetics. When it comes to finish it has the feel of a Standard Bicycle Deck. At first I thought I'd like the aquatic theme but I soon learned that wasn't the case. What i like most about this deck is the can spread that you can create with the deck's back. The Jokers are a pretty cool octopus and they're identical to my knowledge. This deck also comes with a double- sided card.The reason why i give this deck 3 stars is because I'm not a fan of the bubbly art that's consistent throughout the entire deck. The bubbles aren't aesthetically pleasing to me and especially ruin the face cards in this deck. I appreciate them for the artistic value but i probably wouldn't consider buying them or showing them off to friends. I almost didn't buy these because of negative comments about the bubble theme, particularly on the facecards. I'm glad I got them, though, because the bubbles don't seem overly noticeable, and I really love the design and colors. These are just as slick as my Talons, and I like the way they handle right out of the box. 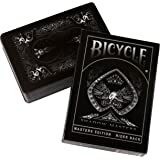 This deck includes one double-backed card and two jokers with the image of an octopus. My 16 year old son loves these. They are super slick and he.can do his fan out with them. They have a trick card that allows him to do some fun things that he couldn’t do with a regular deck. They work so much better than a regular deck for tricks. 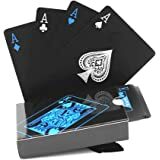 I'm always so pleased with the Ellusionist decks I order for my boyfriend. He's a collector so it's my go-to present for him on special occasions. This deck functions flawlessly, like all the others I've ordered. It shuffles well, is super easy to deal, and performs tricks with great ease to the user. We're also super happy with the design. You can tell a great attention to detail went into making this deck. Not only are there fun things to look at on the face cards, but the numbered cards had some fun details too. I wasn't expecting to like this deck so much, and may even steal it back from my boyfriend.